The best meals I've ever were in Chez Panisse in Berkeley. Not even in the famous downstairs restaurant where reservations seemed always reserved far in advance and meals prix fixe past what I could afford in the 80s. I ate upstairs in the Café. Oh my Gods the flavors, the tastes, the smells and how the food just looked. The Grand Canyon down deep inside the canyon by the river a whole mile straight up to above the rim. Ice cold water in your mouth from snow melt high in the Tetons cresting a ridge, and Yosemite's Tuolumne Meadows in the spring as the sun rises through the mist over the still snow-bogged meadow. Thelma Houston live. Taking a bicycle at forty tearing down a hill with your children racing behind. The Golden Gate Bridge and Golden Gate National Recreation Area especially the Marin Headlands where I so often go to just be. Libraries, books, writing, and movies. The look on her face, coming again unexpectedly. And Chez Panisse. Alice Waters gave us what is now called New American Cuisine. High-quality products in season, prepared simply to exacting standards (with enormous discipline) so the natural flavors of the foods and seasonings come through, displayed beautifully, from local markets, bountiful, abundant, overflowing with goodness. 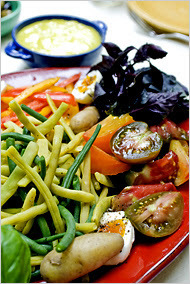 Food prepared by Alice Waters and her successors at Chez Panisse brings joy to all who partake, as if the divine reaches directly from the kitchens of heaven to the tables of earth. 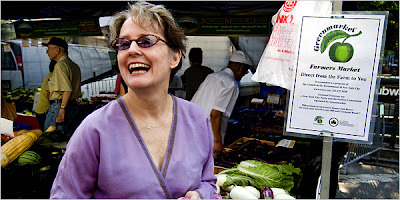 Last week Alice Waters took the food reporter for The New York Times shopping at a farmer's market, showing a video camera precisely how she shops for food. The video is only available at The Times article, and you'll likely want to go watch. The rest of The Times article is also terrific. You'll get to San Francisco sometime. It calls you, that famous place with the Golden Gate. Make the pilgrimage across the bay to Berkeley, home of the University of California at Berkeley (all three of my daughters were born in Berkeley), right next to Oakland. Find your way to Chez Panisse, the restaurant which changed American food. You'll need a reservation, although perhaps not at lunch or for the Café, but either way, plan your trip to make it possible. Write me a letter afterwards and tell me how it went. I genuinely want to know. Famously the downstairs restaurant once served for pudding a single peach on a plate. Not peeled. Not cut up. Just a peach. Chez Panisse was saying: this peach is so good nothing we could do would improve upon it. The night I ate at Chez Panisse, the four-course menu was much like many others that I had read online. On a wooden plate in the middle of the cosy, wood-lined dining room was a dish of the most fabulously bulbous spring onions, huge things the size of a baby's fist. These turned up in a salad with artichokes and morels. After that came a tranche of wild king salmon in fish broth with lemongrass and a dollop of herb butter. At this point I was, frankly, disappointed. The ingredients may have been perfect, but neither dish sang out. The dressing on the salad was understated, the seasoning in the butter low-key. Recipes from Alice's forthcoming book, used during her lunch with the NY Times. 1. 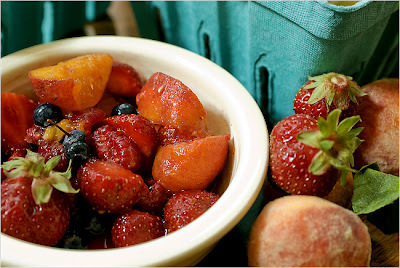 Combine berries, 2 tablespoons sugar and 1 cup water in a medium saucepan with a heavy bottom. Cook over medium heat, stirring constantly, until berries begin to break down and release their juices, about 4 minutes. 2. Add 1 1/2 cups cold water and lemon juice. Bring to a boil, then immediately turn down to a simmer and skim off any foam that bubbles to top. Cook for 15 minutes. 3. Strain into bowl through cheesecloth-lined strainer, pressing on fruit to squeeze out juices. Return the liquid to the pan and add 1 1/2 cups sugar. Stir until sugar dissolves. Bring to a boil and cook for 2 minutes. Remove from heat and let cool. Store in a tightly sealed container in the refrigerator for up to 3 weeks. Vitally important to Alice Waters' work bringing healthy food to American schools and children, and to our plates, is the American farmer. Here is part of an interview called Nurturing Connections With Farmers which I cherry-picked (heh); the rest after the jump. SEASONAL CHEF: A lot of organic farmers are trying to teach consumers that cosmetic appeal is meaningless, that an occasional bug comes with the territory. And yet in your books, you stress the importance of aesthetic perfection in food. Would you serve flea beetle-bitten arugula in your restaurant? WATERS: Yes, but I would think about how to use it. I probably wouldn’t make an arugula salad out of it. But I would throw it into the pasta. If it was an apple with little spots all over it, I wouldn’t put it on a fruit plate but I would make a tart out of it. I would choose something else that looks real good for the fruit plate. SEASONAL CHEF: Why do you prefer organic produce? WATERS: Taste, for sure. And I’m interested in it because I know I need to support the people who are taking care of the land and thinking of the future, people who are thinking about how communities come together. It’s my feeling that that can happen when the person growing the food is connected with the person who is eating it. A result of those connections is a sense of caring about somebody else’s welfare. That’s how you build up those bonds which ultimately leads you to a sense of a group made up of people who care about one another. I’m interested in organic food for all those reasons. But of course also because organic produce is pure and wholesome and delicious and alive when I get it. And nine times out of 10, it’s picked very ripe. SEASONAL CHEF: Given that consumers seem to have an insatiable demand for convenience, can farmers markets compete with supermarkets? WATERS: I think they can. When you come in contact with the people in the farmers market, and the food, and you taste it, you can never go back. There’s no comparison. Yes, it takes a little longer to shop at the farmers market, but what you get, in my mind, is an experience that enriches one’s life. It’s an experience of connecting with people. It smells good. It tastes good. It has a good feeling about it. There’s no way that that kind of experience can’t seduce people and make the supermarket experience in comparison pretty depressing. Also we have to begin to understand that a little bit of time shopping in farmers markets will save time in the cooking. If you buy ripe tomatoes, all you have to do is slice them. You don’t have to add salt and sugar, all that stuff that you do to doctor things up that don’t taste very good in the first place. Also I think the message about the hidden costs of supermarket produce for your health and for the health of the community must be understood. I’ve always said give your money directly to the people who are growing it. They need it. And we don’t need a middleman. SEASONAL CHEF: Do you think organic produce can gain acceptance in supermarkets? WATERS: I love that supermarkets are getting organic produce. It brings a certain kind of consciousness to the general public. But organic produce in supermarkets is so overpriced and usually it is not very good looking and, in fact, sometimes rotten because it doesn’t have a long shelf life. People may buy something like that, spend a lot of money on it and feel like they got something that represents organic produce. So I can’t really decide whether it’s doing a disfavor or a service to the organic movement. In general I think it’s probably not a good idea to have it in a supermarket. But sometimes you’re dependent on supermarkets. And I would rather buy slightly second-rate organic produce than conventionally grown produce. Then I will make something of it. I’ve thought there should be somebody in the supermarket who could hawk organic produce a little bit. But supermarkets don’t seem to be able to afford someone like that. There are millions of checkers and helpers all around the store, but supermarkets just don’t seem to understand the need to have someone like that in a produce section. Food matters. Healthy food and fresh water nurture the heart of life. Enjoy your Sunday. Eat something fresh and tasty.